Slide-Lok of Minnesota. The announcement comes on the heels of the announcement of Slide-Lok of San Antonio last week and Slide-Lok of Edmonton the week before. 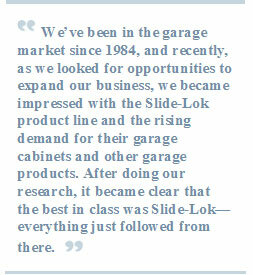 This time, garage interiors brand giant Slide-Lok has partnered with successful Minnesota businessmen Laurin Leih and Brad Madison to create Slide-Lok of Minnesota. The Minnesota Master Dealership will serve the expanding market for garage storage and garage cabinets in the Twin Cities, Duluth, St. Cloud, Rochester, Mankato, and Fargo-Morehead, by selling and installing the leading solution in space saving, adaptable garage storage systems—Slide-Lok. www.slide-lokofminnesota.com, or contact Slide-Lok at 800-835-1759 or www.slide-lokofthebayarea.com.